Mr. Paul Chorney, 96, passed on December 26, 2018 surrounded by family at Springfield Hospital in Springfield PA. Born in Woodlyn, PA, Mr. Chorney remained a lifelong resident. He graduated from Ridley Township High School. After graduation, Paul proudly served his country for 3 years during WWII driving a tank in the 4th armored division. Under General George Patton, he fought in the Battle of the Bulge for Bastogne. For 33 years he was an adjustor at the former Scott Paper Plant in Chester, PA retiring in 1984. Paul caddied at the Spring Haven and Concord Country Clubs into his early 80’s and remained an avid golfer. He was an accomplished gardener and was a life member of the West End Boat Club in Essington, PA. Surviving is his son David Chorney and daughter Susanne Ciliano and also survived by 4 grandchildren and 4 great-grandchildren. He was predeceased by his wife Margaret, in 2007 and a daughter, Madeline Chorney in 2006. 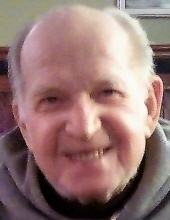 Relatives and friends are invited to his viewing on Thursday, January 3, 2019 after 9:00 a.m. at the Kovacs Funeral Home Inc. 530 W. Woodland Ave, Springfield, PA 19064 until time of his funeral service at 11:00 a.m. Internment will be at Chester Rural Cemetery, Chester, PA. Donations in his memory may be made to the Cerebral Palsy Association of Delaware County, 1229 Swarthmore Ave, Folsom, PA. 19033. To send flowers or a remembrance gift to the family of Paul Chorney, please visit our Tribute Store. "Email Address" would like to share the life celebration of Paul Chorney. Click on the "link" to go to share a favorite memory or leave a condolence message for the family.